My first foray into model engineering locomotive building was a 3 ½" gauge 'Rob Roy', and I found the overall experience to be enjoyable. My second was a Reeves 'Lifford Hall' which also went well, and produced a very enjoyable locomotive to run. After finishing both locomotives I started to look around for a new challenge but what to build, something a little bigger, more powerful, unusual ? As we are all aware there are many locomotive projects that can be built from castings supplied by the many UK suppliers, but I fancied something different. 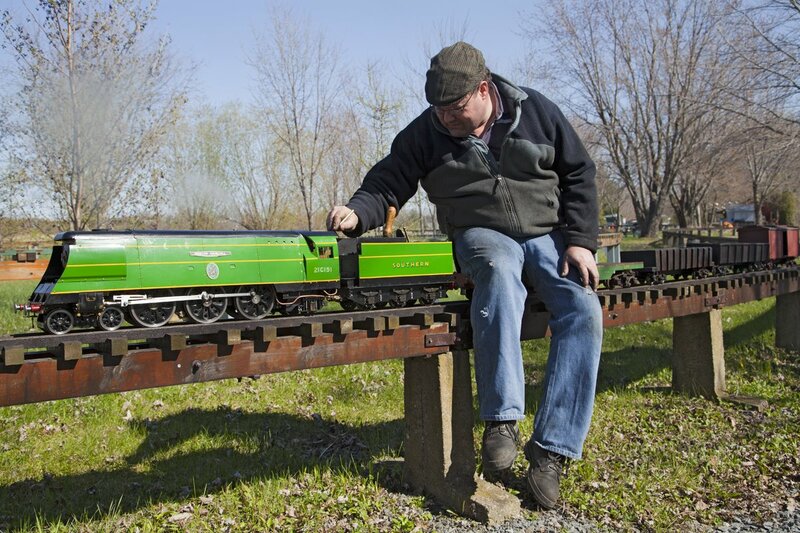 I have lived in Canada since the late nineties, living here has some advantages, most houses have basements, good locations for workshops, imperial material sizes; but it can also lead to challenges with regard to the availability of castings for locomotive projects (shipping, duty etc. 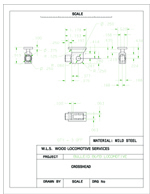 ), even castings for local types of North American locomotives are expensive with spotty availability at best. Also, nipping to the NRM in York to find original drawings is out of the question. I spent some time looking through my small library of railway books; I eventually came across the book "Steams Last Chance" by Kevin Robertson. I re-read the book and it started my interest in Bulleid locomotives. How about a Leader ? I quickly started to research the available information on the internet, I immediately came across this website and the article on Kevan's beautiful model of the Leader. However it soon became apparent that technical information related to the valve gear and power bogies was sparse. My target of building a 3½" gauge representation with the original power bogies and oscillating valve gear was unrealistic; time for a re-think. Discussions with local club members and friends from other North America clubs was getting me no where, plenty of suggestions for Northern's, Hudson's, etc, then one day a friend from Ontario suggested "How about a spam can ?" I started my research again, this time in addition to this website I found many more detailed images of locomotives, and more importantly parts of locomotives, it was promising. After reading the various articles on this website I decided that I needed to concentrate on the valve gear design, I quickly found a number of pictures and schematic images which helped with the basic understanding of how the valve gear worked. 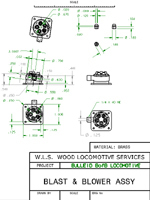 I purchased a book "The Bulleid Pacifics of the Southern Region" by Cecil J Allen, this contained a nice image of a valve gear function demonstration model, this provided the information I needed to start the design process. My present employment is as an Aerospace Design Engineer, this job provides access to some CAD software, so during my lunch times I started to generate some geometry for the locomotive. 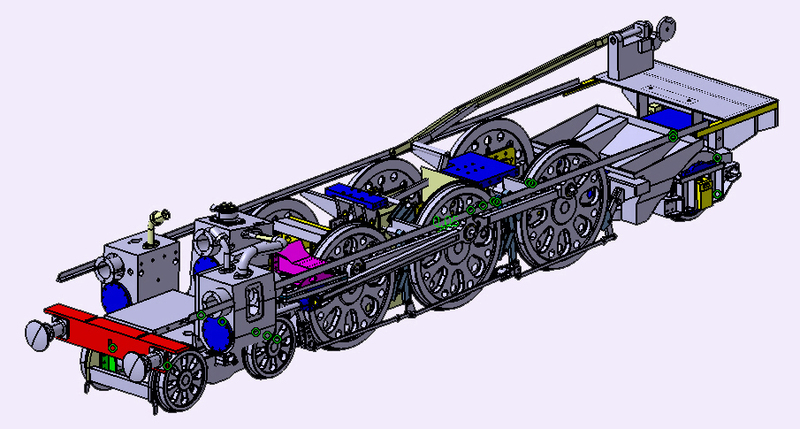 Some nice side elevation drawings provided the driving wheel diameter, axle spacing, overall height and lengths; this enabled me to design the frames in way of the main driver axles, and this geometry in conjunction with a known frame spacing provided an envelope for the design of the famous Bulleid valve gear. My first challenge was finding a roller chain that was small enough, I eventually found a US company that sold stainless steel roller chain and sprockets that used a pitch of 0.147"; they fitted in the envelope between the centre crank axle and the frame. 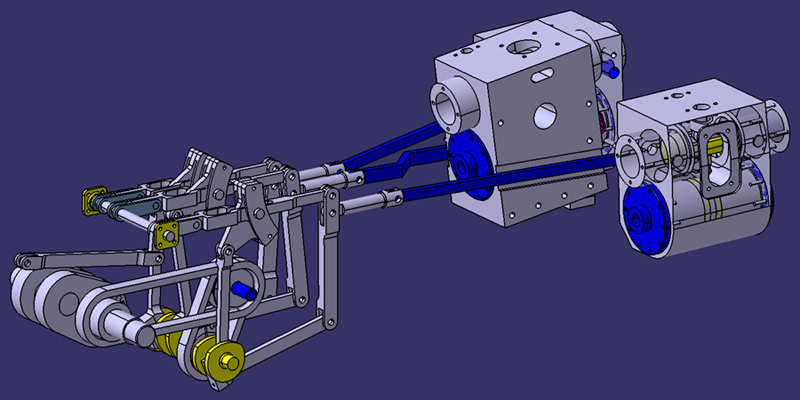 The next challenge was the basic geometry of the three throw crank, the union links, the three throw crank to expansion link levers, and the upper horizontal link of the mechanism, these were scaled from the images I had available. 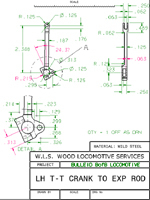 Once the basic geometry was generated it was inputted into the Late Charles Dockstaders Bulleid valve gear program to check the overall geometry, and the generated valve motion at the valve gear output shafts. The geometry of the cylinders and valves was then generated using the available valve travels, once the geometry was checked a kinematic 3D wireframe model was generated for one cylinder to ensure the correct valve events were occurring; with some minor tweaking I had an acceptable configuration. 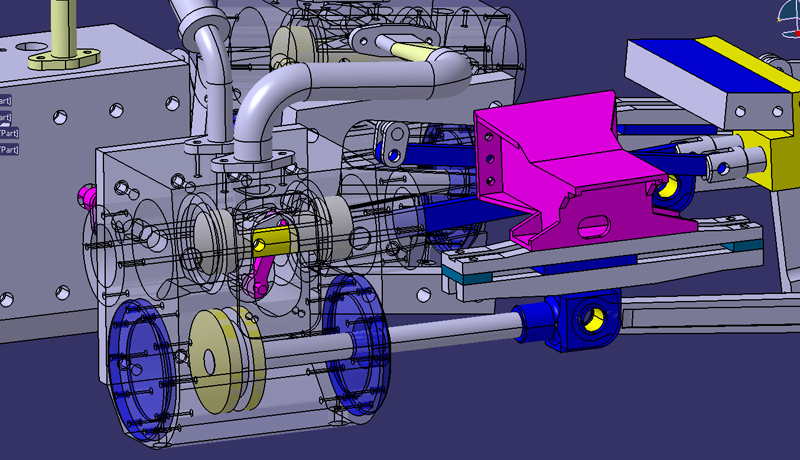 Once the basic geometry was verified I started to create 3D models for all the valve gear, designing in 3D provides the opportunity to check for interferences between moving parts and the frames. The 2D drawings are created from the 3D models, I produced a full set of drawings for all the levers, rods, piston valves etc. The next issue was wheels, I contacted our colleagues at Reeves and they indicated that they had a number of front and rear truck wheels and main drivers available, but they also indicated that the stock would not be replaced once sold, so I purchased a set. The cylinders are machined from naval bronze bar provided by a fellow club member, the design I came up with looked a bit off-putting at first but with some careful machining they turned out nicely. The crank axle was built up from silver steel rod and gauge plate webs secured with loctite and pins, and has only come loose once to date (used the wrong grade of loctite). The reverser arrangement is purely mechanical, and uses a cab mounted threaded rod to provide the necessary motion to lift and lower the horizontal links. Once all the parts for the frames etc were made and pivot pins made, they were assembled. The link rods from the valve gear to the cylinder mounted valve actuating levers were made to suit, and the locomotive was run on air; the exercise went well, running in forward and reverse was smooth with few stiff components. There is a Youtube video of this exciting occasion - click here . With the main obstacle cleared I concentrated on the design of the rest of the locomotive. 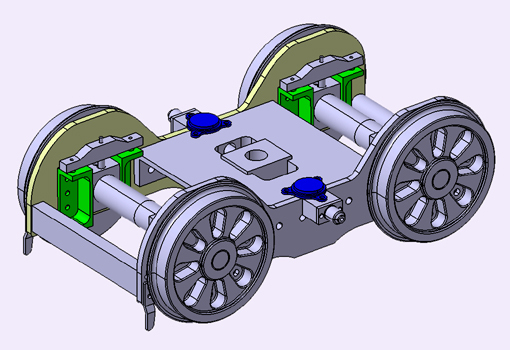 The front truck is a simplified representation of the prototype front truck complete with coil springs and anti friction tables, it does not have any self centering features. The rear truck was fabricated from several hand forged bars silver soldered together, with separate side frames attached with screws; it features the same anti friction tables that the front truck used and coil springs, the axle boxes were machined from solid. The boiler is a modified Britannia boiler; it has a parallel front barrel made from 4 1/8" copper tubing, a tapered centre barrel with the tapered section underneath and a wide firebox, much bigger that anything I had built previously. All wrappers and plate were made from 1/8" thick copper and 15 x ½" dia tubes and 2 ¾" dia superheater tubes were installed. 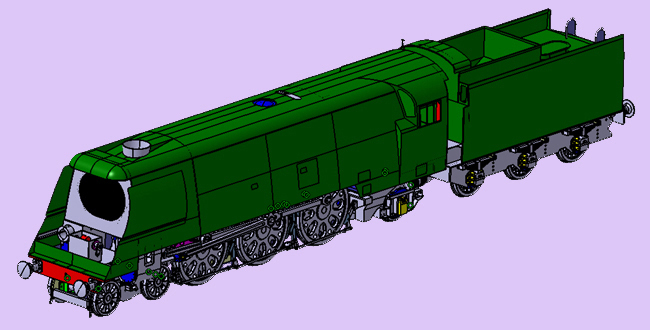 I actually wrote a series of articles on the boiler build, these can be seen here . 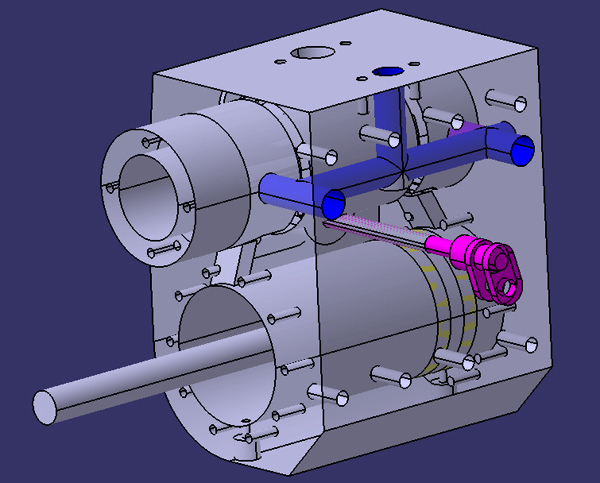 Three safety valves are installed, and a central blow down valve is located between the frames. Rather than an in-boiler throttle, I made a poppet valve throttle based upon the Britannia throttle, this unit was installed in the smoke box and is operated by an external rod driven by a cab mounted throttle lever. One of the most striking parts of a Bulleid Pacific with its cladding removed is the smokebox, I designed and fabricated the smokebox from steel sheet silver soldered together, the smokebox door was made from brass sheet and profiled to outer shape and section. The blast nozzle is a 5 nozzle unit as per the prototype with 5 blower jets; the chimney was designed based upon the prototype sizing. The cladding, cab, roof etc were fabricated from brass sheet, the cab proved a challenge in way of the forward windows; it came out nicely in the end. 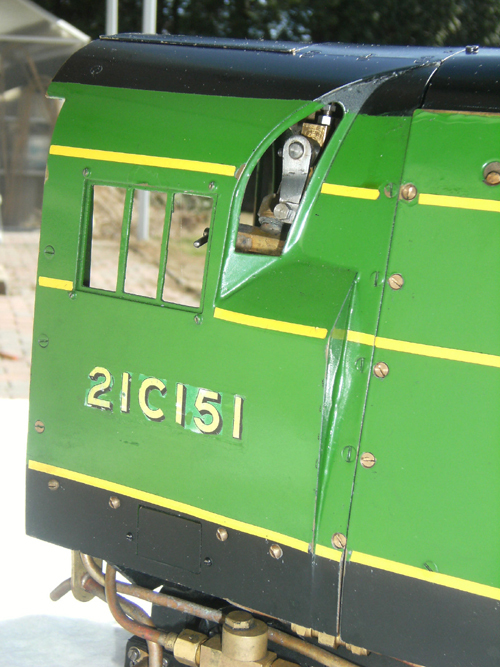 The boiler cladding panels, roof and cab are attached to various brackets mounted to the cab floor and smokebox, and they can be removed quickly for trouble shooting. The cab was designed in 3D then developed views were made of each part, the parts were cut out, formed then soft soldered together, I am very happy with the result. 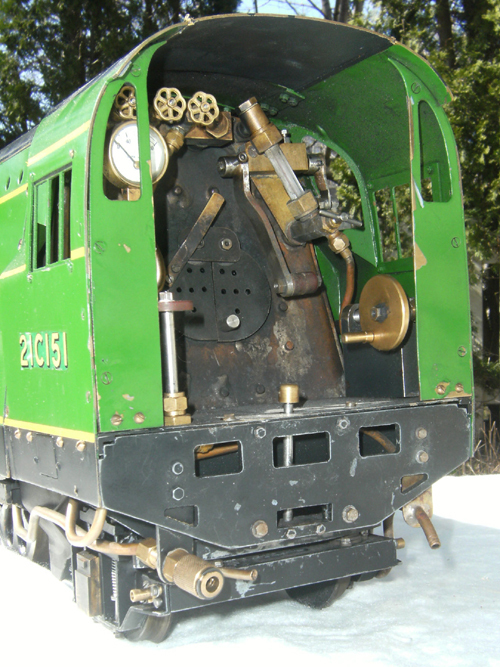 On the full size loco, the valve gear is located within a so called sealed box. As this was impractical on the model, I made two removable oil baths that can be removed easily for cleaning, they retain enough oil for running and can be emptied through removable plugs. So far I have had no complaints about fouling the track. The valve gear box has a cover installed between the boiler and frames, this cover has copper tubes soldered to its lower surface, each tube aims at specific points of the valve gear, the other end of the oil tubes are accessible on the right hand side, pumping oil into the tube with an oil can lubricates the valve gear. 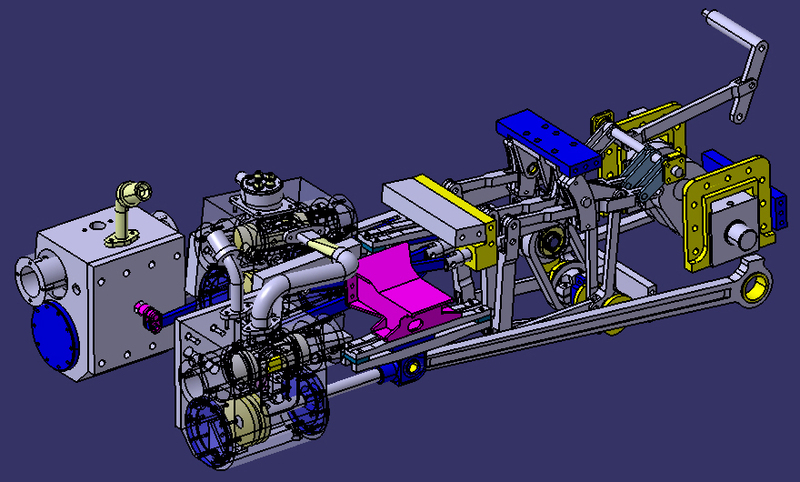 The tender presented its own problems, no wheel castings available and very specific looking axleboxes, leaf springs and leaf spring anchors. I made the wheels from steel bar and drilled holes in a radial pattern, the axleboxes were machined from bronze, the leaf springs were assembled from separate brass leaves, and the spring hangers machined from steel. As far as the plumbing on the locomotive is concerned, it has an axle pump with quite a large bore and a good sized injector; getting water into the boiler does not seem to be an issue. After finishing the assembly of the parts I decided a steam test was in order, I and my good friend Mr Jim Leggett of Montreal Live Steamers went to our club on the 27th of March, 2011. The weather was cold and windy but the steam run went well, no complaints for a new locomotive. For a video of the test run, click this Youtube link. 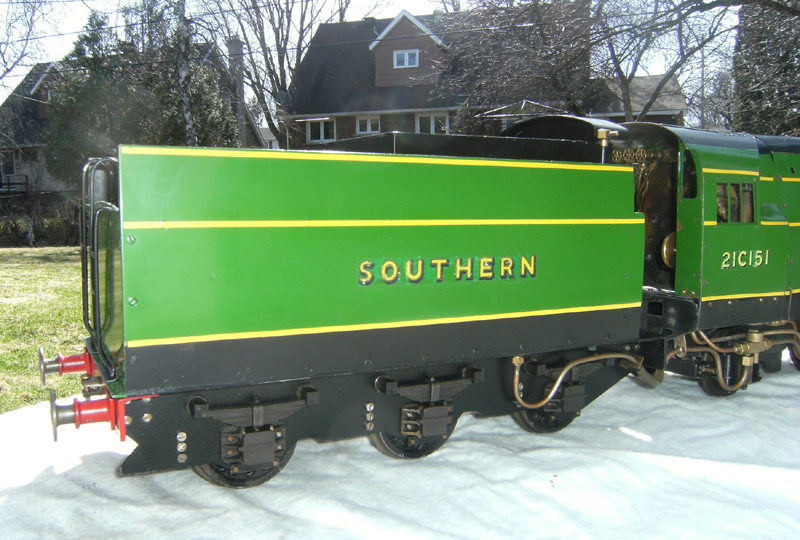 The livery had to be as per original, paint was sourced (John Deere Green) and the loco was painted, sunset yellow stripes were applied. The locomotive is numbered 21C151 'Winston Churchill' for a couple of reasons, the first being that it is the only original locomotive I have seen in person, plus the local railway museum here in Montreal (Exporail) has a 7 ¼" gauge nmodel built by Bassett Lowke. The first season of running revealed a number of irritating issues, I had in the interest of adjustability, made many of the joints adjustable, but after continually loosening, many of the joints were either silver soldered or permanently pinned. I had a good 2012 season with 21C151, there is never a shortage of steam or power, and the throttle provides a nice smooth acceleration, my North American colleagues always comment on how quiet she is. I would like to take this opportunity to thank all the other gluttons for punishment, who have or are undertaking the construction of one of Mr Bulleid's fine locomotives, the images, pictures and information that this website contains helped me immensely, and shows that the creativity and model engineering abilities of the individuals are second to none.